PCL baseball • Clinics, camps and tournaments will grow. 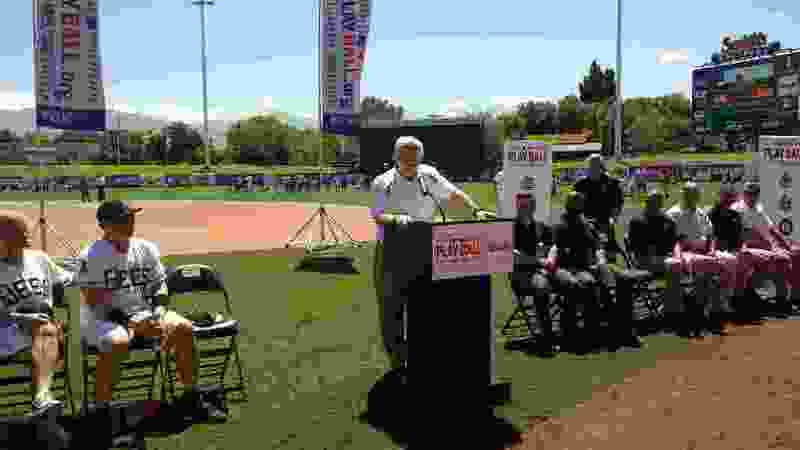 Lynn Worthy | The Salt Lake Tribune President and CEO of Minor League Baseball Pat O'Conner speaking at Saturday's Play Ball event at Smith's Ballpark. An estimated 500 youths participated in Major League Baseball's "Play Ball" event at Smith's Ballpark on Saturday, which also served as an announcement by the Salt Lake Bees that they will expand their youth baseball initiatives. The Bees will establish a Junior Bees program in which youth players will wear Bees jersey, receive a ticket to a regular-season game as well as an invitation to a skills clinic at Smith's Ballpark. The Salt Lake Bees Knothole Club, the largest kids club in minor league baseball, will become the Salt Lake Bees Kids Club in 2018. A new Salt Lake Bees Baseball Academy will start in the fall of 2018 and will include clinics, camps and tournaments. "An important part of what we do with the Larry H. Miller Group of Companies is give back to the communities where we live, work and play," Bees general manager Marc Amicone said. "We believe this kind of event enriches the lives of those who are in our communities." Major League Baseball's Reviving Baseball in Inner Cities (RBI) program has started a pilot program in Rose Park, the first RBI affiliate in the Salt Lake area. RBI is a development program that includes educational support as well as skills development. "That's really what this is all about, giving kids an opportunity to play," said Tony Reagins, former Los Angeles Angels general manager and current senior vice president of youth programs for Major League Baseball. "We're excited about the partnership and the relationship. I think we're going to launch a new RBI program in this community. The Bees are going to take softball and baseball under their umbrella, which is really exciting and really how it should be done." Former MLB All-Star catcher John Buck, a Taylorsville High School graduate who played 11 seasons in the majors, has settled in Utah with his family in following his playing career. In recent years, he has become more active in coaching youth baseball. "Seeing the level of coaching and knowing that I have a way to make that better, I just feel like I can do something," said Buck, who has 9-year-old twins as well as a 3-year old. "Whether it's an academy I'm going to open, whether it's clinics that I can do, whether it's programs I can set for coaches themselves — coaches are coaching because they're passionate and caring — and what we have in common is they care about what's going on with kids in general. "My [goal] is to give them the expertise they need for the game itself but also what made me successful — sharing those things." Buck played for the Kansas City Royals, Toronto Blue Jays, Florida Marlins, New York Mets, Pittsburgh Pirates, Seattle Mariners and Los Angeles Angels from 2004 through 2014. When asked about the rumors that he plans to open a baseball training facility in the near future, Buck said, "Yes, that's in the works. There's obviously a lot of things that have got to happen to have that come to fruition, but that's kind of where I'm spending a lot of my time. I think there is an overwhelmingly glaring need to do it for kids just in general."